collectSPACE - news - "Interview: Astronaut 'Survivor' Dan Barry"
March 13, 2006 -- collectSPACE spoke with three-time shuttle astronaut Dan Barry the day after he was shown being voted off the island during the episode of CBS's Survivor Panama: Exile Island that aired last Thursday. What attracted you to be on Survivor? "The second reason, it's a fun thing to do! It's a neat place to go, and it's games to play and I like doing that. "The third [motive] is I think it's a reasonable model for looking at group dynamics in long duration space flight. Think about it: you've got a small group of people, you have confined space, they're under stress, they are continuously monitored and you want to know how they are going to perform under emergency situations, right? You want to see what happens with a diverse group of people and see what personalities match and which ones clash. We don't have that model anywhere — submarines, Antarctica — none of that stuff fits the bill. Survivor actually fits it remarkably well. "Think about the two tribes that you saw: basically people who, probably, are pretty much equal intelligence, equal morals — I'm not sure at the beginning you could have picked one tribe in front of the other. And yet one tribe is completely dysfunctional and the other tribe really likes each other. Go figure." Did your astronaut experiences affect the way you played the game? "The things that you get from the training to become an astronaut are perfect for that because when you begin you think, 'There is no way I am going to learn this 3-foot pile of manuals and all these skills and things I need to go [to space], and look at these people that are walking around having figured that stuff out. How is that possible? "As you go through the training, you find out that it is possible. You can do it and it's just a matter of persevering. If you ask me what's the most important thing to bring to Survivor, it's that sense of 'I can do this, never give up, keep up the hard work' type of thing." 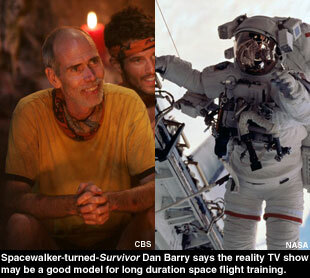 What about your astronaut survival training, did it help you survive on the show? "Maybe a little bit, in the sense that we had a fire real early on, and if you took a look at our shelter, I built that shelter on day two. Digging post holes 18-inches deep, putting rocks down for the foundation and pounding them down — take a look at that thing, it's awesome. So, there were skills that I learned in survival training that helped but mostly, once again, in survival training one of the big messages is 'You might be down with a broken leg and unable to move, bleeding and all this stuff — never give up! Do whatever you have to do to contact the people that are trying to come find you. Never give up.' And I think that's really, in the end, the key." How did 'tribal politics' compare with vying for a seat on the space shuttle? "I would say there really wasn't much of a relationship. The tribal politics are [contained] within your group. "The very first day when you show up as a shuttle astronaut, at least when I did, the chief of the [astronaut] office comes in and says, 'You know what, you all have made the cut. It's not going to be a matter of who gets to fly and who doesn't get to fly — you are all going to go fly in space. Now is the time to come together and bond as a team. Show us you work well with a team and use your strengths to help somebody else's weaknesses (and vice versa) and everybody in this room is going to fly in space.' And that came true within about four years of our [group's] arrival [at NASA]. "There is definitely competition to get seats on the shuttle and go fly again, but the atmosphere that I experienced during astronaut training was very much one of cooperate, help each other out and we're all going to go fly." Why did you choose to hide your astronaut status when you arrived on the island? "Mostly because I wanted people to not look at me as, 'Oh, he's the astronaut, so he can do A, B, or C' or have these preconceived notions of who I am or what I could do. I wanted them to just know me for 'Dan'. To understand who I was, to accept me for the performance that I was going to put out on the island. Then later, once those relationships were established and I felt comfortable in the friendships, I figured then I could then tell them a little more about myself and share few things that will not fundamentally change the relationship we have, it will just cement the friendship or firm up a bond that was already there." So in hindsight, given what happened just before you were voted off, it was not a mistake to tell the others? "I don't think that telling them [that I was an astronaut] had anything to do with the vote. I think that Nick and Austin were completely constrained. If they vote against Terry, they are going home. I think they felt bad about what they did. It's possible that they didn't know that Terry had the Immunity Idol. It was clearly in their best interest to break up our alliance because then Nick and Austin get to stay! (laughs) So, kudos to Austin for going to Terry and saying 'Hey, come on, come with us.'" Other than Nick, Terry and Austin, did anyone else know you were an astronaut? "No, not even Misty, who wants to be an astronaut." Are you watching the show now that it's airing? "Oh sure! It's a hoot and a half. I love watching." So, have there been any surprises as you have been watching? "I had no clue how completely dysfunctional [the other tribe] Casaya was! (laughs) We got a sense of that at the challenges, but really had no sense of how bad off they were. We did, at one challenge, give them water because they were so hurting and they asked for it. So I was a little ticked off later when they won the fish and didn't offer us any food. I think that would have been appropriate." Did you know that Terry had located the Immunity Idol on Exile Island? Have you heard from your former crew mates or other astronauts since being on the show? "Oh yeah... lots of people writing e-mails, some people calling. They think it's pretty funny." Who would you nominate to be the next astronaut on Survivor? "Oh man, that's a tough one. I think [Rick] CJ Sturckow. CJ is a hoot and a half. He's this super tough Marine, in-your-face kind of guy and he's also the sweetest, nicest family man you could ever meet. It think the world of CJ. We flew together, he was the pilot on [STS-] 105. I just think he's a rough-tough cowboy Marine but he's got a really good heart. I think he would do great on Survivor." "I have a robotics company, Denbar Robotics. We aren't building a product yet but we're designing robots that are ultimately going to help people with disabilities. It's a lot of fun." Was that the reference that your kids made to a robot in the televised "family moment"? "Yeah! That's Neel. The name comes from [author Isaac] Asimov's Daneel. If you are familiar with Asimov robotic novels, there is a character called Daneel who is this amazing robot that winds his way through a number of the novels. Our robot isn't up to snuff to be called 'Daneel', so we're just calling him Neel." What became of your trademark yellow shirt and Gilligan hat that you wore throughout the show? Did you sign any autographs while on the island? "No, I haven't signed a single Survivor autograph yet though I see that in my future." Lastly, had you won and by some twist you were offered a choice, which would you take: the million dollars or another spacewalk? "Oh, I would take the spacewalk instantly. Are you kidding? "To fly in space is the privilege of our age. That is such an amazing experience, to see the Earth from above the sky. It is just so breathtaking, and not just because it's a visual sensation but because it's the pinnacle of what human beings have been able to achieve. It's the technology that our century — and by that, I mean the 1900s — will be remembered for. "Five hundred years from now, nobody is going to remember World War I, World War II — that's going to be like what went on between the Greeks and the Trojans. What they will remember is that in 1969, Neil Armstrong walked on the Moon. It's just like what do you remember from the 1400s? The only thing anybody knows in the 1400s is that Columbus discovered America. The only thing, I think, that anybody is going to remember from the 1900s 1000 years from now will be that was the century we left the planet. "The honor of having been someone who flew in space in the 1900s is immense for me."